The area between Cromwell Road and Fulham Road has a wide variety of building styles to view on this 3 mile walk from Gloucester Road tube station to South Kensington station (Piccadilly, District & Circle lines). 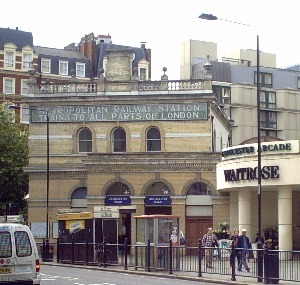 Notice this has two station buildings - the ox-blood tiled facade of the Picadilly line adjacent to the light-coloured Metropolitan (now District & Circle). This has some broad-fronted buildings of the 1880s by Ernest George & Harold Peto, influenced by Northern European styles. Numer 39 was the residence of W S Gilbert. Collingham has properties by the same architects. The school stands on the site of a home of Beatrice Potter. The houses were built in 1850-60 and one has a plaque to the singer Jenny Lind. The development included the church of St Mary located in the central gardens. A house in the attractive Cresswell Place to the left has a blue plaque to writer Agatha Christie. Go right into the Fulham Road, left and first left into Elm Place. At the end go right along Selwood Place. Pelham Crescent was built in 1833. Opposite is the distinctive Michelin Building now a Conran shop & restaurant. It was built in 1911 as the headquarters of Michelin Tyres and the glazed wall on Sloane Avenue replaces the loading bay. Inside 34 tiled panels depict motoring & aviation heroes and races of the early 1900s. On the right is the former Old Brompton Road Station on the Piccadilly line. This opened in 1905 and closed in 1934 (see below). On the left is the Brompton Oratory designed by Herbert Gribble and built in Italian style between the 1880s & 1890s. In 1927-32 it was decorated with marble, gilding, mosaics and stations of the cross. Behind this lies Holy Trinity Church of 1826-9. Opposite is an entrance to South Kensington tube station (Circle, District & Piccadilly lines). Admission is free to the Science, Natural History and V&A Museums and all have cafes.